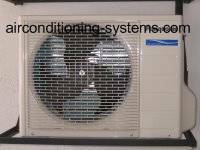 Air conditioner blower or fan is one of the key components that is needed as part of the air conditioning system. The function of the blower is to produce air movement to the space that is being conditioned. There are basically four types of fan that are commonly used in the HVAC equipment. They are the propeller fan, centrifugal fan, vane-axial fan and tube-axial fan. You will probably encounter this type of fan in your daily life. It has a disk type wheel mounted on a plate with a direct drive or belt driven motor connected to it. When it is operating, it is noisy and is only used in applications where noise is not a factor. Look out for its usage as exhaust and condenser fan. It is used in applications where low pressure differentials but large volumes of air movement is required. It is also known as axial fan as the air flows parallel to the axis of rotation of the fan. A condenser of a split air conditioner that uses a propeller fan. This type of fan is also known as radial fan as the air flows perpendicularly to the axis of rotation of the fan. One category of the wheel design is the forward curved centrifugal fan which is also known as squirrel cage blower. It has forward curved blade with a cut-off design that prevents the air from going around the fan housing. It is quieter than the propeller type and provides high differential pressure between the inlet and outlet. This type of fan is suitable to be used to move air in the ducts around the building. Backward Inclined with flat and single thickness metal blade is another design which is used for smaller units applications. Backward Curved with curve and single thickness metal blade is used in medium and high static pressure applications. Airfoil with curve and double thickness metal blade design is sometimes used. Its aerodynamic design makes it a popular design in applications where efficiency and quietness are required. This design has a disk-type wheel which is housed in a cylinder tube. Air guide vanes are built into the tube to guide the flow of the air properly. This design has a propeller inside the cylinder with belt-driven or direct drive motor connected to it. In air conditioner blower where the motor capacity is 5 tons or below, direct drive permanent split capacitor motor has been used due to its better reliability and lesser parts to maintain compared to the belt driven type. The belt driven type has pulleys and fanshaft bearings that will wear off over time hence regular servicing is required. The PSC motor has a RUN winding, START winding and a RUN capacitor which are active when the motor is running. It is quiet and starts slowly before running at a steady state speed. The fan turns at the same speed as the motor and multi-speed fan can be achieved. You can see many wires coming out of the windings of the motors for speed selection. Four fan speeds with speed ranging from 800 rpm to 1500 rpm is commonly available. 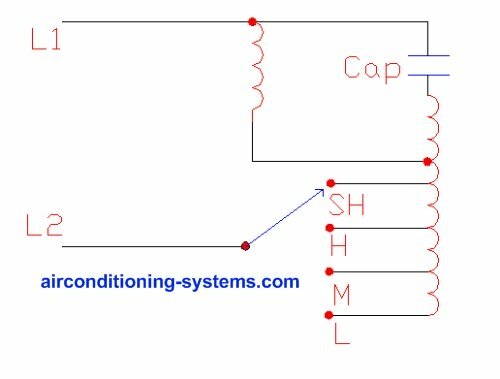 By using relays to select the windings to be connected to the AC power supply, the speed of the air conditioner blower can be controlled.